Even your best raincoat would end up being wet when soaked under water for longer periods. But now a new waterproof clothing is being developed by Swiss chemists which never gets wet even though completely soaked underwater. The natural example of extreme water resistance can be seen on the surface of Lotus leaves. Similar to that, a new clothing which never gets wet has been developed by the Scientists which makes use of combination of water repelling substances and tiny nano structures. 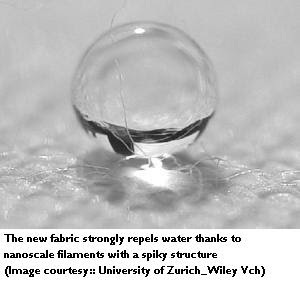 Lead Researcher Stefan Seeger at the University of Zurich says the fabric, made from polyester fibers coated with million of tiny silicon filaments, is the most water-repellent clothing-appropriate material ever created. “The water comes to rest on the top of the nano-filaments like a fakir sitting on a bed of nails,” he says. Drops of water stays as spherical balls on the top of this fabric and only with a tilt of 2 degrees of the clothing from horizontal they roll off like marbles. Also, a jet of water when thrown on the fabric bounces off it without a trace. The secret to this incredible water resistance is the layer of silicone nano-filaments, which are highly chemically hydrophobic. The spiky structure of the 40-nanometer-wide filaments strengthens that effect, to create a coating that prevents water droplets from soaking through the coating to the polyester fibers underneath. The clothing thus made like when soaked completely under water even for longer periods of time, it will be as dry as the day it went in. And the same technique can be implemented with wool and cotton clothing also besides Polyester. So this type of clothing would be best suited to design Swimsuits and raincoats. Anyways lets hope it soon comes to the market and with the use of this we can go out in rain without the fear of ever getting wet. Such an amazing discovery from a scientist! Do you have any idea how much is the cost of this? I think this is so expensive. Indeed its an amazing discovery , and as of now it is yet to be used to make swimsuits or raincoats only after which we can know the exact cost. As you have guessed it might be costly coz its worth it… what you say? ?